Charles S. may or may not be on Donald Trumps hitlist. As a scientist at Oak Ridge National Laboratory he works on carbon dioxide capture and Trump may think of him as one of those climate scientists. Oak Ridge is part of the United States Department of Energy that will soon have a new climate-sceptic boss (Reuters link). In a recent Angewandte article, S. (this blog has decided to protect the identities of the scientists involved) together with Neil W., Michelle K. and Radu C. report on a new way to capture carbon dioxide. The method is not aimed at CO2 scrubbing at carbon-fuel energy plants but at so-called direct-air capture (DAC) , a real challenge because with DAC CO2 concentrations are really low. The best DAC chemisorbent at the moment is aqueous sodium hydroxide but it is difficult to isolate soluble sodium carbonate and even more difficult to release the gas again, requiring temperatures of up to 800°C. Release is a must if it is eventually permanently stored, for example underground. The new champion is 2,6-Pyridine-bis(iminoguanidine) (PyBIG) synthesised from 2,6-pyridinedialdehyde and aminoguanidine. Exposing an aqueous solution of the compound to air for several days will result in (PyBIGH2(CO3)(H2O)4) crystals precipitating out. That is each PyBIG molecule sequestering 3 molecules of carbon dioxide. Heating this compound again at 120°C releases all CO2 in one hour. The authors attribute the CO2 sequestering properties of PyBIG to the basicity of its guanidine groups, the poor water-solubility of the complex and the favourable orientation of the carbonate groups in the crystal structure. Qin et al. have reported a new take on the classic Barton decarboxylation. This organic reaction is usually associated with Barton esters that have low stability and have a terrible smell. A similar ester based on N-hydroxyphthalimide was found with equally desired electron accepting properties. 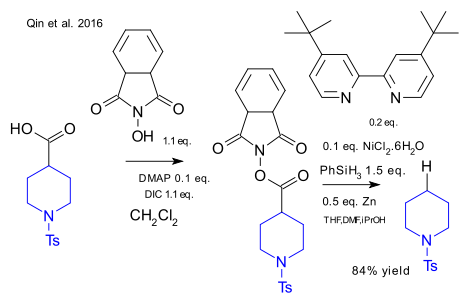 In the optimized reaction this ester was reacted with elemental zinc and nickel chloride (forming an active catalyst Ni(0)) and a bipyridine ligand. Phenylsilane was the proton donor. Key advantages: low reagent costs and low water/air sensitivity, the reaction can be run as a one-pot reaction. We have been critical of Lee Cronin in the past here and here but the recent accomplishment of Kitson, Glatzel & Cronin (doi) as we shall see is remarkable: everything open-sourced! : publication medium (Beilstein J. Org. Chem.) - 3D-printer (RepRap)- printer API (Octoprint) - hardware (Arduino) - software (Python) - synthetic method (McQuade 2016). Everything! The 3D printer RepRap can build it's own components (!) and it is deployed to build a reactor (15 ml range). Every-day laboratory reactors are made of glass or steel but now plastic? Standard polylactic acid suffers from the chemicals used but polypropylene does not. Disadvantages: poor thermal conductivity requires reactions to run at room temperature and the vessels can not be sealed. Also, no stirring bar! Not printed: the PTFE tubing and needles. In order to control the liquid pumps an Arduino control board was used. Truly everything open-source and affordable! The reaction sequence: isobutylbenzene, propanoic acid and triflic acid were used in step 1 (a Friedel-Crafts acylation). Next iodobenzene diacetate and trimethyl orthoformate in methanol were brought on-line for a 1,2-aryl migration. The final step consisted of hydrolysis by a potassium hydroxide solution. Total time to reaction completion : 24 hours in a 34% yield.